I wanted to share a new fold I tried for the first time! This is the Double Dutch Fold and was the featured fold on Splitcoaststampers last week. I made this with Our Daily Bread designs Jan. release, Birthday Blessings (image) and Special Blend (sentiment and frame inside). I used SU! for my base and SEI Promise Me for the pretty little teacup paper. I made the belly band with a Martha Stewart punch. 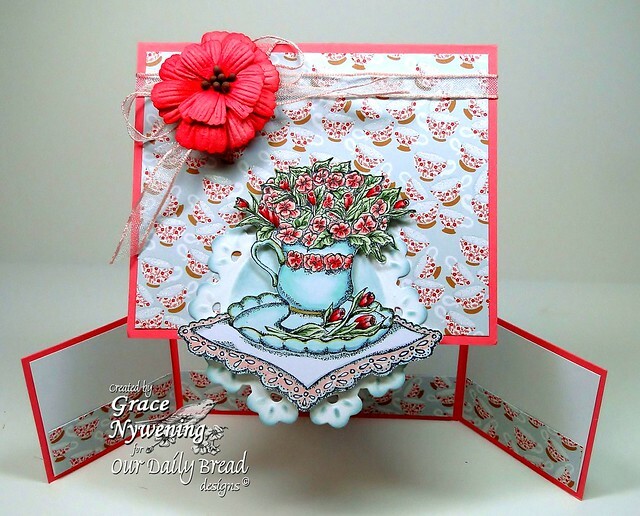 I used a Spellbinder's Floral Doily die behind my teacup image. The image is colored with Copics. I like the fold on this! Very easy and fun! You can find it in the recourse section of SCS or use this link! 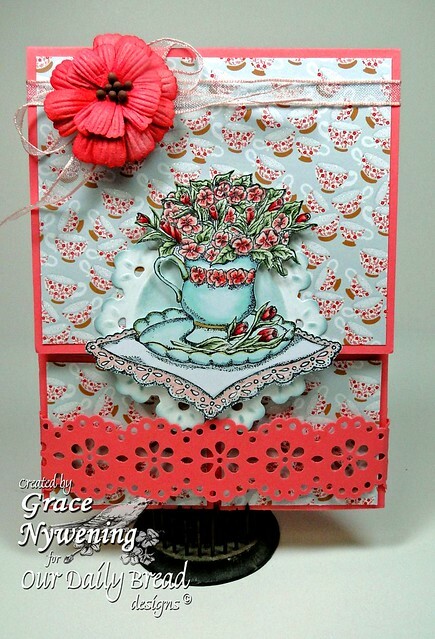 Gorgeously layered card! thanks so much for playing with us at Simply Create Too. WOW...how beautiful is this, Grace...I'll need to try that technique - it looks very difficult though! How absolutely beautiful -- as always! Love the double fold! This is absolutely gorgeous! Love the image and the papers you chose. Fantastic job. So glad you joined us this week for the Fancy Fold challenge at Pattie's Creations. Grace, What a beautiful card! I love this type of a fold too. The colors are so pretty and that image is beautiful. Thanks for joining us at Pattie's Creations Design Challenge. Thanks so much for sharing this with us at Meljen's Designs this week! However, we do require a Meljen's Designs image on our challenge entries. Please check out our assortment of Freebie images and $1 images in our shop. Hope to see you again really soon! Grace, this is the sweetest, ever!! As one who is always intimidated by folds...you've made me want to give this a try!! Really beautiful colors and love your focal image, beautifully colored!! This is so gorgeous Grace - just gorgeous. WOW! A beautiful card! And thanks for alerting all of us who missed it on SplitCoast that there is yet another interesting way to create a card with a unique fold. Now... to try it myself! Perfect job on this card! So pretty. Thanks for joining us this week at Crafty Creations Challenges! Grace - this is Beautiful!! Thanks for playing in our 'Fancy Folds' Challenge #35, and for using a Digital OR Stamped image! WOW Grace this is totally BEAUTIFUL!!!! LOVE LOVE this design and your colors are FABULOUS!!!!! Gorgeous card hun! Your cards are amazing. I've just had a feast here tonight. Beautiful card. Love that image. Did this fold in December, isn't it fun to play with! Thanks for joining Fresh Brewed Designs for our month long challenge to 'Use something new'. Wow, what a gorgeous card! Very cool fold, I'll have to check that out!